With anecdotal reports of the stocking up of canned foods and freezable produce slowly appearing in the news media, one company is ahead of what no doubt will become the norm - food black markets - just as they did during the World Wars of the 20th Century. So-called,Brexit Box Survival Kits are now on sale at a cost of £300 each have been launched over food supply fears caused by the lack of logistical planning to ensure no delays to the 10,000 lories that pass through the Port of Dover each day. Most of our fresh fruit and vegetables come from the EU mainland in a system which guarantees last minute delivery to supermarkets. With the impending delays caused by a ton of new paperwork and a chronic lack of customs staff, fresh fruit and veg will become scarce say supermarkets. The London Economic reports that more than 700 people have bought the ‘Brexit Box’, which contains enough food for one person to survive without anything else for a month. Inside the package, which has a shelf life of 25 years, there are 60 freeze dried meals, 48 portions of meat, a water filter and fire starting gel. Some of the meals included in the Brexit Box are beef and potato stew, chicken tikka and pasta bolognese. Emergency Food Storage UK also sell a deluxe Brexit box, which includes puddings and breakfasts. The BBC website recently reported: 'A number of Brexit survival-themed products have appeared for sale and several online discussion groups have been set up. More than 3,500 people have joined the Facebook group 48% Preppers which says it discusses "the practical preparations people are making for life after Brexit". 'Hundreds of people have snapped up the emergency supplies packages filled with tinned and freeze-dried meals. 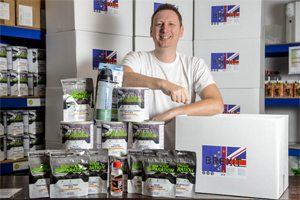 They are being sold by a company called Emergency Food Storage which sells packs of long-life food that can last up to 25 years, with one package on offer providing customers with 18 months worth of emergency food. The company, who usually sells to aid agencies, has recently introduced two Brexit themed options on its website - the Brexit Box (£295) and the Deluxe Brexit Box (£595). It comes as two of Britain's biggest supermarket chains revealed they are stockpiling food to prepare for a "no-deal" Brexit. 'Meanwhile, some mums on the popular parenting forum Mumsnet have revealed they are stockpiling in preparation for a potential emergency if the UK's departure from the European Union ends in chaos, Hull Daily Mail reports. A 'Prepping for Brexit' thread on the site has mums swapping tips on which food items and household goods to stockpile in case of a Brexit shortages in the supermarkets.